Freedom Baptist Church v. Township of Middletown. The Becket Fund for Religious Liberty (n.d.). Retrieved from https://www.becketlaw.org/case/freedom-baptist-church-v-township-middletown/. Freedom Baptist Church v. Township of Middletown. (Apr. 04, 2019). https://www.becketlaw.org/case/freedom-baptist-church-v-township-middletown/. "Freedom Baptist Church v. Township of Middletown." The Becket Fund for Religious Liberty. Accessed [Apr. 04, 2019]. https://www.becketlaw.org/case/freedom-baptist-church-v-township-middletown/. 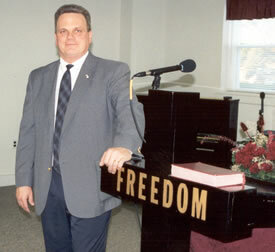 Becket represented Freedom Baptist Church, a small religious community of about 25 members in Middletown Township in Pennsylvania, just west of Philadelphia. In the fall of 2000, Pastor Chris Keay began a search for suitable space to hold worship services in Middletown Township. Pastor Keay soon signed a lease on the first floor of an office building below a dentist’s office. However, the building was in a “no religion” zone. After having worshipped in the space for six months, a Township Zoning Officer came after the church, claiming that it was in a zone in which religious worship was not permitted under any circumstances. The church applied for a variance but was denied. It had no choice but to bring a lawsuit under the U.S. and Pennsylvania Constitutions as well as the Religious Land Use and Institutionalized Persons Act (RLUIPA). In its defense, Middletown challenged the constitutionality of RLUIPA, but Becket argued in favor of RLIUPA at the district court. Judge Stewart Dalzell issued a ruling issued on May 2002, upheld the law. It was the first time that a federal court had ruled on the constitutionality of RLUIPA’s land use provisions, and the decision has since been cited as precedent in other cases around the country. In November 2002, Judge Dalzell signed an agreement in which Middletown agreed to revise its zoning ordinances to comply with RLUIPA and pay attorney’s fees. Freedom Baptist Church was represented by Becket and by local attorney L. Theodore Hoppe.